2) They'd have the number of delegates their national poll standing showed at that time. A flawed analysis, yes, but something that would give a general backing to my theory at the time that a #2 Cruz was going to win the nomination. It is amazing what two months will do! My assumptions were 22% accurate! Or as Ted Cruz's campaign staff would say, "78% inaccurate." 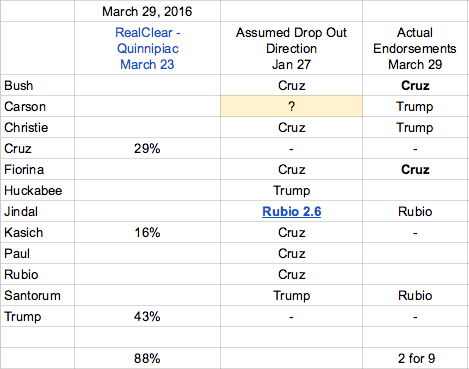 Here is the updated spreadsheet, using the March 23 poll data from Quinnipiac, and showing the actual endorsements to date. Scott Walker endorsed Ted Cruz today. Walker was out of the race before my January 27 worksheet, as were others. One deception that I've hit on many times in the 2016 primaries is the falsehood that Ted Cruz is more anti-establishment than Trump. Rush, Levin and many more have been pushing this lie. 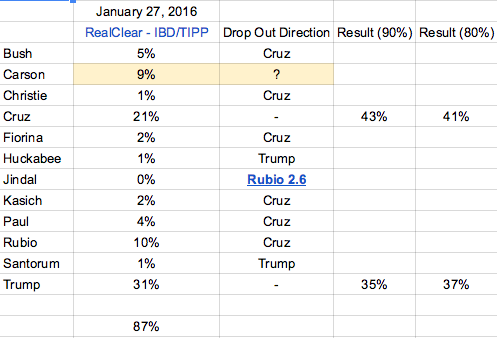 Part of my January 27 post was intended to show how many of the GOPe candidates would back Cruz if Cruz remained #2 into March. That was true of Bush and Fiorina. The biggest miss in my predictions was Christie backing Trump. I never saw that coming and am still shocked. For me it hurt Trump, as Christie has no conservative bone in his big-boned body, and in my opinion he was one of the key establishment candidates. I figured accepting Christie's endorsement was Trump's strategic move left in preparation for the general election season. Regardless, the only endorsements that could hurt Trump more than Christie's would be Glenn Beck's or Mitt Romney's. As it stands now, Cruz will need to win 85% of the remaining delegates. The Internet consensus today says the only way he can realistically win the nomination will be to steal it at the convention. Anyhoo - Let this be a lesson to my three loyal readers. I'm sharing what I see here, when I see it. But that doesn't make it right.